Thank you for your response to my letter, I do hope you are well. Unfortunately my addiction has not quelled and I continue to buy on an almost daily basis. That aside I'd like to thank you ASOS Curve for your translation of high fashion. Thank you for high street prices and models in sizes that are easier for me to understand. Thank you forever 21 for listing the dimensions of 1X there are some days you see when I'm closer to 2 I'm glad I know what measurement it is that makes that true! Thank you Evans for your delivery today, I'm glad it was free after I'd spent £40 On my good deed. P.S Can you see that this stuff goes on sale on payday at 80% off, with free delivery in size 1X/UK18? While I love shopping online I MUST write all online plus stores this open letter! I do hope you're well, you're one of the few places that has my attention on a daily basis. The only place in which my addiction will quell. I'd like to ask you though, to please show all items on models of bigger sizes. 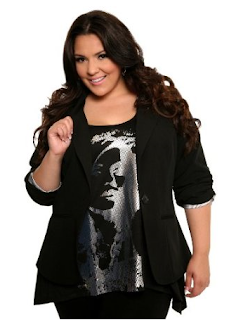 Its no good having a piece of clothing on sale in sizes 8-32 if the model in the picture is a 2. Please show us what it looks like in bigger sizes. I personally feel curves are easier on the eyes, but more importantly the cut changes so us examples of all sizes in your ranges. Better still, list the dimensions of the piece (in larger sizes) so that we can better work out on what size we should feast. Services have been set up like dressipi to help us decipher what size we are in different stores... Isn't that a message that we need your help to buy more? Another thing, please ship for free if you're going to take more than 3 days. We'll pay more if we need it today or tomorrow, but why cause us extended sorrow if we didn't pay for it to arrive the next day? Evans / Style 369 - while I tend not to like the "fit" of the clothes here (they assume a very odd shape indeed) - they offer free standard (3-5 working days) delivery on Style 369 and nominated day delivery at £5 for a week day £7.50 on the weekend. Standard Delivery on Evans is £4.00. Forever 21- I have been in love with faith 21 and forever 21+ since I first stumbled across it at crabtree mall in NC. Since they opened stores in the UK (3) only one has a very measly plus section, the perk- the full range at amazing prices online! Delivery is free over £50! £3.95 for standard delivery which takes between 2 and 4 days, £4.95 for express delivery between 1 and 3 days. I'm not sure they've thought that through - and If I'm honest I've ordered things on a Sunday and had it by Tuesday before and I didn't pay that extra £1! Simply Be, I love what they're trying to do. But delivery varies by the item you buy in my experience. Standard delivery is always at least £2.99 taking up to 6 days to arrive, next day is £3.99 nominated day delivery is £6.98 (Standard delivery + £3.99). Keep us posted on your positive or negative shipping experiences!!! Full Figured News. Simple theme. Powered by Blogger.